I have always loved World's Fairs. When I was a tiny tot, we vacationed at the New York World's Fair in 1965. The Fair brought some of my earliest memories, and some of my happiest. 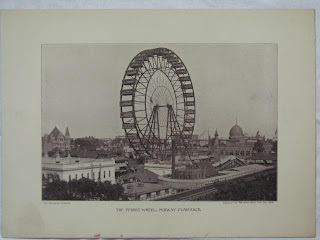 I am always thrilled to find vintage World's Fair items to list on eBay. 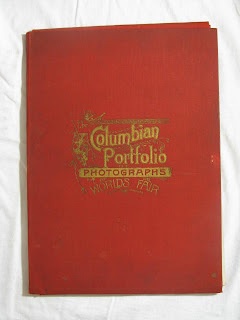 Last week I found this beautiful folio of photographic prints of the 1893 Columbian Exposition (Chicago World's Fair). 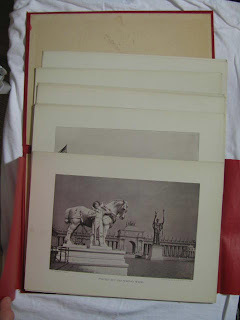 There are 24 photographs in this collection, including the work of architects Louis Sullivan ( Transportation Building ) ... Richard Morris Hunt ... McKim Meade White. This is also the fair that brought us the world's first Ferris Wheel and the work of Nicholas Tesla and his experiments with electricity. I frequently treasure hunt with my best friend, who is an architect and designer. He agreed that this is an amazing find ... these prints would be beautiful framed! Just too neat not to share! Sold for $69.99 to a documentary filmmaker who intends to use these prints in a future project.